Freedom is not free. We owe our freedom to those who have made the ultimate sacrifice for our nation. As we do each year on this weekend we pay our respects to all of our servicemen and servicewomen who have served and sacrificed for our nation. Here is an excellent tribute to all those who have served in our military: Past and Present. We served with 87 members of Alpha Troop that gave all and did not return. They made the ultimate sacrifice for our Nation, Alpha Troop, and their fellow soldiers. Take time to remember them this weekend. 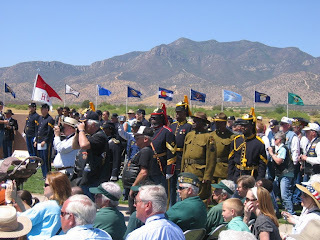 On May 16th fifty-eight Civil War and Indian War soldiers were reburied with honors at the Sierra Vista National Cemetery in Sierra Vista, AZ. Les Stafford, A Trp 66/67, attended the ceremony and provided these photos. Click on the photo to see it full size. 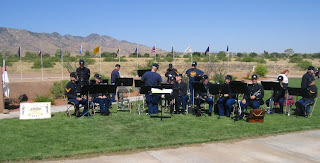 4th Cavalry Memorial Band plays during ceremony. The remains were discovered during construction that uncovered an abandoned cemetery in Tucson. They were exhumed to make room for the Pima County court complex. Some of the soldiers fought in the Civil War while stationed in the Arizona Territory. Others were assigned to Arizona during the Indian Wars. Two were are Indian scouts, and one is a Buffalo Soldier. Caskets of the 58 soldiers. The soldiers served as cavalry, infantry, cooks, musicians, or farriers. Most had been assigned to Ft. Lowell in Tucson. The soldiers names were identified through the use of old military and cemetery records. The names were not matched to specific remains because of a lack of DNA evidence. Honors rendered during the ceremony. The governor of Arizona, other dignitaries, and a large crowd attended the ceremony. 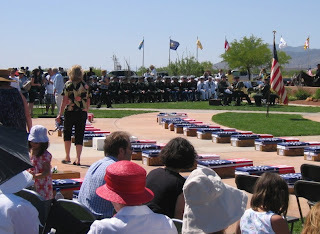 Several Veterans organizations in Arizona came up with the idea to move the soldiers remains to the National Cemetery and planned the reburial of the soldiers. The U.S. Department of Veterans Affairs provided marble markers for the graves. Thanks Les for attending the ceremony and providing these photos. 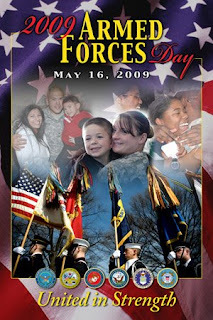 Today is Armed Forces Day. It will not get much coverage in the news. It is an important day that was created in 1949 by President Truman so that our nation can honor our servicemen and servicewomen that serve around the world protecting our freedom. It takes a great deal of courage to join the military. Maybe even more so today when it seems that service in the military is looked on as a lesser calling by some portions of our society. Those who serve today are our new "Greatest Generation". They know the meaning of "Duty, Honor, & Country and they know sacrifice. I am proud of them all. My hat is off to each and everyone of them. It is also special for those of us who served during previous conflicts like our Vietnam War. We have a bond with those who serve today. I know you all do this but anytime you see one of our servicemen or servicewomen thank them for their service. It makes their day a whole lot better to know that they are appreciated. The purpose of the Ride to the Wall is promote healing among ALL veterans and their families and friends, to call for an accounting of all Prisoners of War and those Missing in Action (POW/MIA), to honor the memory of those Killed in Action (KIA) from all wars, and to support our military personnel all over the world. The ride is conducted in a safe, supportive and private atmosphere in which all participants can reflect and heal on their journey to the Vietnam Memorial in Washington, D.C. in the hope that they can return home to a new beginning. If other former troopers are participating in the Run for the Wall, let us know and we will annotate it here.